Search engines read the text to know the topic of a page and there are three tags that specifically alert the search engine to what a page is about: Title, description, and keywords. Yola provides an area to edit these tags. 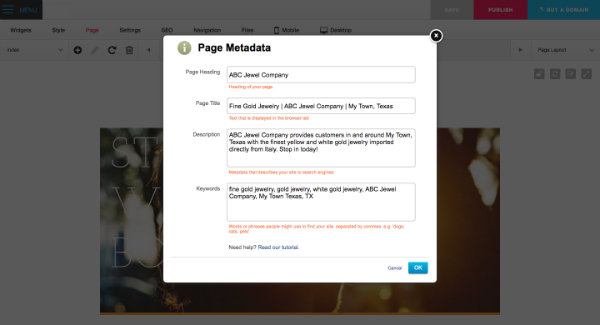 To access this area click Page > Metadata. ABC Jewel Company provides customers in and around My Town, Texas with the finest yellow and white gold jewelry imported directly from Italy. Stop in today! It is important to remember that just adding keywords to the Keywords field is not enough. You also need to ensure that you blend your keywords into the content on the relevant page. Again, don't stuff them in - blend them in casually making sure to keep the flow of your content. Interested to see how you could improve your SEO tactics? Try Yola Gold.